Elettaria cardamomum is a member of the ginger family (Zingiberaceae). It is sometimes known as the 'queen of spices' alongside black pepper (Piper nigrum), which is known as the 'king of spices'. The dried ripe fruits of cardamom have been used as a spice and in medicines since the 4th century BC. Cultivada en Colombia; Alt. 1300 - 1400 m.; Andes. Amomum subulatum (large cardamom, Nepal cardamom, black cardamom) - cultivated in northeastern India. The fruits are larger and have a coarser taste and aroma. Used in meat dishes and pickles. Elettaria ensal (Sri Lankan wild cardamom) - morphologically similar to E. cardamomum, but a more robust plant with erect panicles and more elongate fruits (3-5 cm). The chemical composition of the fruits is significantly different. Aframomum corrorima (Korarima cardamom, grains of paradise) - cultivated on a small scale in some African countries, such as Ethiopia and Nigeria. Elettaria cardamomum is native to the Western Ghats of southern India. It has been introduced to other parts of tropical Asia and is widely grown for its aromatic seeds. 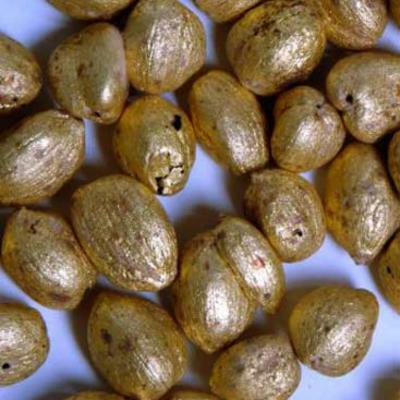 It is grown as a crop in many countries, including Guatemala, Sri Lanka, Papua New Guinea and Tanzania. Overview: A herbaceous perennial growing up to 6 m tall. Leaf-shoots arising from a stout rhizome. Growing in a thick clump of up to 20 leafy shoots. Leaves: Dark green, long and sword-shaped. The underside is paler and may have a covering of tiny hairs. Flowers: Borne on a flowering stalk that can reach over 1 m in length. The pale green flowers contain both male and female parts. One of the petals is white and streaked with violet. Fruits : Pale green to yellow and elongate oval-shape. Each fruit has three chambers filled with small aromatic seeds, each about 3 mm long. The fruits and seeds dry to a straw-brown colour and are widely used as flavouring. The dried fruits and seeds of cardamom are used to add a unique taste to rice, meat (including hamburgers, pizza sausages and Swedish meatballs), vegetables and other savoury dishes. 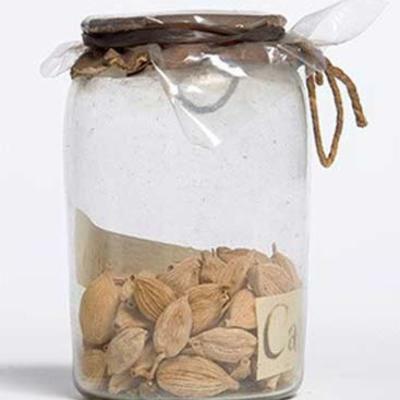 Whole and ground cardamom seeds are added to flavour coffee, tea, liqueurs, ice cream, confectionery and baked goods (including Danish pastries). Cardamom is highly valued in Kashmir as an essential ingredient of the fragrant drink kahwa and sweet Kashmiri black tea. Cardamom essential oil is extracted from the seeds. It is mainly used in the flavouring of processed foods and drinks such as cordials, bitters and liqueurs and occasionally in perfumery.Cardamom oleoresin has similar applications to the essential oil. It is mainly used to flavour meat products with a short shelf life, such as sausages. Because the oil has antibacterial activity it has been added to foods as a preservative at low levels. It is used in low quantities so it does not affect the flavour of the food. In Ayurvedic medicine, cardamom is used to treat disorders of the stomach and urinary system, asthma, bronchitis and heart problems. When mixed with neem and camphor, cardamom is used as a nasal preparation to treat colds. An infusion of cardamom can be used as a gargle to relieve sore throats, which has led to its use in cough sweets. 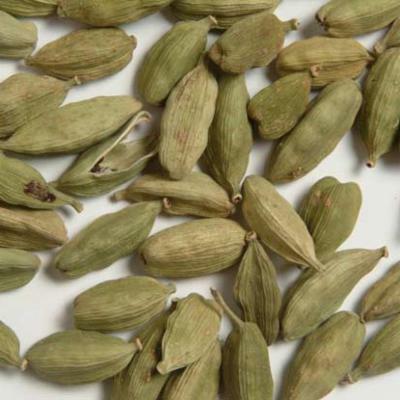 Cardamom seeds have been used in a range of preparations. Roasted seeds were boiled with betel nuts (fruits of the palm Areca catechu ) to make a drink that is used to treat indigestion and nausea.They are also added to tea to make a tonic to relieve the symptoms of stress due to overwork or depression.Cardamom seeds are given to patients with bad breath and a capsule of cardamom taken with honey is reputed to improve eyesight. The traditional uses of cardamom to treat skin conditions have attracted the attention of those developing plant-based cosmetics, especially as it has been used traditionally to treat areas of the body that have red-pigmentation. It is often incorporated into soaps and hand creams. The use of cardamom as an aromatic stimulant is recognised in Britain and Europe, and it is well known for its stomach-calming properties. Cardamom seeds have not been fully investigated for their medical benefits, so it is not known how effective its traditional uses are. To date there are few studies on cardamom seeds that provide scientific evidence for its traditional uses. Researchers have shown that extracts of cardamom have anti-inflammatory activity, but the responsible compounds in the extracts were not identified.The oil from cardamom is usually rich in fatty acids such as palmitic, oleic and linoleic and in 1,8 cineole and alpha terpinyl acetate. No toxicity has been reported for cardamom, but care needs to be taken that the plant being used is cardamom and not a substitute. Cardamom is used as a breath freshener. It is frequently chewed after meals and may sometimes be included as a flavouring in a betel quid. It is used to a small extent to flavour tobacco. Cardamom oil is used in cosmetics because of its cooling properties, and as it is a pale to colourless liquid that can be easily incorporated into different solutions.Cardamom's warm and spicy taste has led to it being used as a flavour for chewing gum. The leaves do not have the same aroma as the seeds, but can be used to wrap fish, rice or vegetables to add flavour during cooking. The long stalks are useful to tie the leaves together to make a neat parcel of food. Cardamom is the third most expensive spice, by weight, after saffron and vanilla. It is traded internationally in the form of whole fruits and to a lesser extent as seeds.Until the 19th century, the world's supply of cardamom came mainly from the wild populations in the Cardamom Hills of the Western Ghats of India. India was the world's largest producer of cardamom until about 1980, when Guatemala emerged as the greatest producer and exporter of cardamom. Cardamom is also grown in Sri Lanka, Papua New Guinea and Tanzania.The main consumers are Middle Eastern countries where it is added to tea and coffee and Scandinavian countries for flavouring baked goods. Cardamom is propagated either vegetatively or by seeds. For vegetative propagation, the rhizomes of large clumps are divided into small pieces that are planted into prepared holes in the soil. This method gives earlier fruit yields than those planted as seedlings, but plant material is often limited and farmers cannot always get hold of it.For large-scale propagation, it is common practise to sow seeds in special nurseries. Fresh cardamom seeds are sown quickly, as they only remain viable for 7-10 days. When the plants are about 1-2 years old, they are planted into a field, below shade trees. Cardamom is often intercropped with tea, betel nut palms ( Areca catechu ) or black pepper ( Piper nigrum ). The fruits are harvested in about the third year. They are still green, but the seeds within them have changed from white to brown or black. The fruits ripen over an extended period and are harvested every 3 to 5 weeks.They are then washed and the stalks are clipped off. Different methods can be used to dry the fruits. Whole green fruits are usually dried in special curing rooms, known as flue curing, which retains the green colour. Whole bleached cardamoms are sun dried and bleached in sulphur fumes. Some of the large enterprises use modern tray or tunnel dryers to reduce drying time. Whole straw-coloured cardamoms are sun dried. Sometimes loose seeds are sold. Cardamom oil is produced commercially using crushed fruits. It is used mainly as an alternative to the spice for flavouring a wide range of processed and frozen foods, condiments, gelatines and beverages. It is also used to a minor extent as tobacco flavouring, and in cosmetics, soaps, lotions and perfumes. Oleoresin is used as an oil substitute in similar products. Cardamom fruits have been traded in India for at least 1,000 years. Many historical Indian texts mention cardamom as a flavouring and medicine. The medical compendium Charaka Samhita written between the 2nd century BC and 2nd century AD refers to it as an ingredient in some preparations. 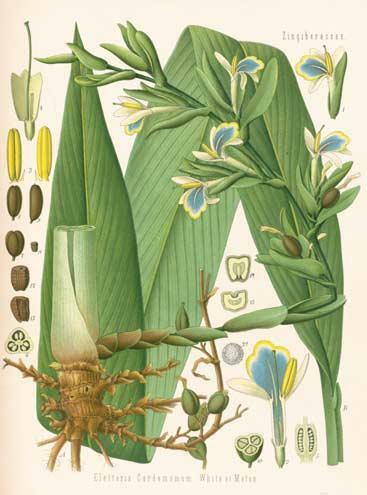 Cardamom is also mentioned in Sanskrit texts of the 4th century BC in a treatise on politics called Kautilya's Arthashasthra and in Taitirriya Samhita where it is used in offerings during ceremonies.By this time the Greeks were importing spices from the East, which they called amomon and kardamomon. 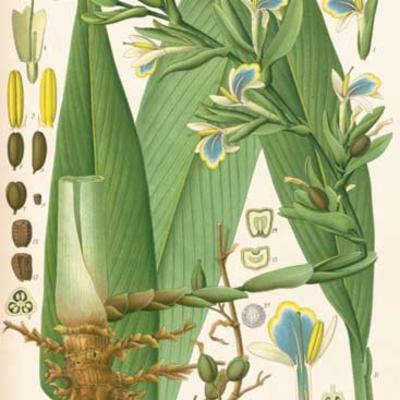 Later Roman writers also distinguished two varieties, but it is not clear from the descriptions whether they were the true cardamom that we recognise today.In the 11th century, cardamom was included in the list of ingredients in India for panchasugandha-thambula or 'five-fragrance betel chew' in the Manasollasa or Book of Splendour. It was also included in recipes from the court of the Sultan of Mandu dating from about 1500. These recipes include sherbets and rice dishes flavoured with cardamom. True cardamom became an article of trade with South Asia in the last thousand years when Arab traders brought it into widespread use. Exports from the Malabar Coast, close to where cardamoms grew wild, were described by the Portuguese traveller Barbosa in 1524. By the time of Garcia da Orta in 1563 the international trade in cardamoms was well developed.Kerala continued to monopolise the cardamom trade until colonial times. It was bought by the Raja's officials, and some of it was sold to Muslim merchants while the best quality was exported. In the 19th century British colonies established cardamom as a secondary crop in coffee plantations in other parts of India. A low-growing, leafy tropical plant that grows on the forest floor in the wild: cardamom must be grown indoors in temperate regions. 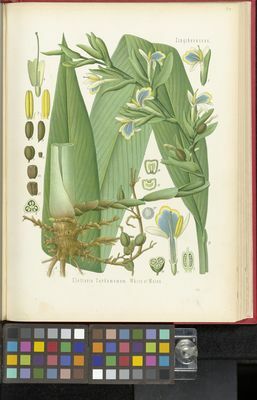 Cardamoms have smooth green leaves on long stalks, which are spicily scented when bruised. The cardamom pods sold for cooking are picked when unripe so the seeds will not grow if you try to sow them. Hardiness: Cardamom will not survive outdoors in temperate regions, even in summer. It requires a heated greenhouse or a warm, shady humid place inside a building - hot steamy bathrooms are ideal. The minimum temperature is 22°C, but it will tolerate places a little colder for a short time if kept dry at the roots. Propagation: Usually by splitting a larger plant into small pieces. The roots are tough - you may need to use a sharp knife. 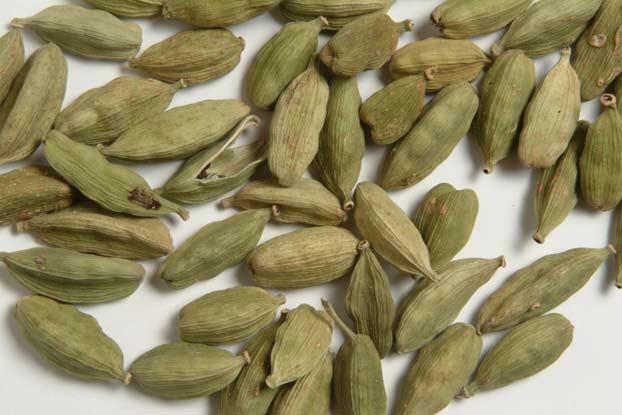 Cultivation: Cardamoms do not do well when exposed to draughts, sudden changes of temperature or direct sunlight. They should be grown in a warm, steamy, shady place and misted daily with rainwater. Alternatively, the pot can be stood on a big saucer of pebbles that are kept moist, to create a humid atmosphere around the plant. In winter, watering should be less frequent. Plants should be fed with a foliage house-plant food (high nitrogen, low potash) when the plant is growing. Pests: Usually trouble free. If plants are too cold their leaves turn brown. If moved to a warmer place, with the brown leaves cut off, they often regrow although this can take a long time. Keep the plant fairly dry while it is recovering. If the leaves develop brown tips at any time (even if the plant is kept warm) it is a sign of overwatering. Elettaria cardamomum is grown in Kew's behind-the-scenes Tropical Nursery and is sometimes on display in the Waterlily House. 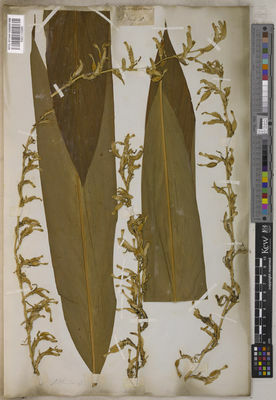 Pressed and dried specimens of Elettaria cardamomum are held in Kew's Herbarium. Details of some specimens, including images, can be seen in Kew's Herbarium Catalogue. 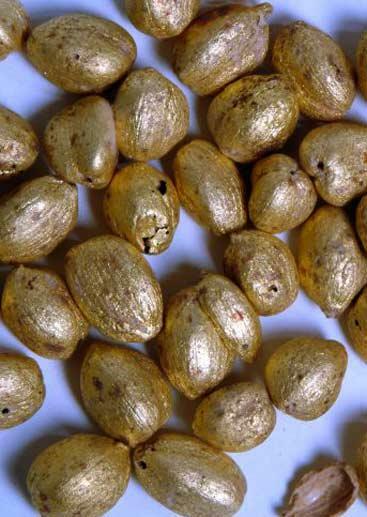 Cardamom seeds, fruits, oil and gold-coated fruits are held in Kew's Economic Botany Collection. Not considered to be threatened. Larsen, K. (1996). A prelimanary checklist of the Zingiberaceae of Thailand Thai Forest Bulletin (Botany) 24: 35-49. Mabberley, D. J. (2008). Mabberley’s Plant-book: a Portable Dictionary of Plants, their Classification and Uses, Third Edition. Cambridge University Press, Cambridge. Parthasarathy, V. A. (2008). Spices: Volume 1 - Major Spices. Today & Tomorrow's Publishers, New Delhi. Ravindran, P. N. (2002). 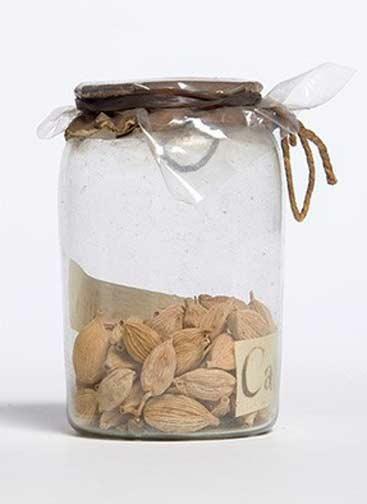 Cardamom: the genus Elettaria. Taylor & Francis, London. Kiple, K. F. (2000). The Cambridge World History of Food. Cambridge University Press, Cambridge.